Fig. 7055 Packed Tower Gas Scrubbers are low-energy gas scrubbers. They are used for gas absorption, cooling, and recovery. Because of their high scrubbing efficiency and low power consumption, they are used in many industries for a broad range of applications. Scrubbers of this type perform best when gases to be handled are free of particles, since these tend to clog the packing. In operation, scrubbing liquid enters the tower through a nozzle and is sprayed uniformly across the top of a packed bed so that it trickles evenly through the packing material from top to bottom without channeling. Gas enters the tower through the inlet near the bottom and passes through the support plate into the packed bed, counter current to the flow of the scrubbing liquid, contaminants are removed. After passing through the packed bed, the cleaned gas passes through a mist eliminator section near the top of the tower. Here, any entrained liquid is removed before the clean air is discharged through the outlet. Fig. 7055 Packed Tower Gas Scrubbers are designed to remove most of the common gas contaminants at very high efficiencies (up to and beyond 99%) with low pressure losses. Fig. 7055 Packed Tower Gas Scrubbers are available in standard sizes, but can also be specially designed or modified to fit unusual service conditions. When desired, S&K can supply a complete, packaged system including fan, recycling pump, and liquid storage for recycling. 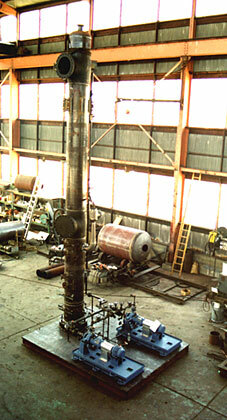 For more detailed information about Packed Tower Gas Scrubber, Bulletin 7S and Bulletin 7S Supp. Literature. To submit a Request for Quote (RFQ) for Packed Tower Gas Scrubber, Adobe PDF or submit an online interactive RFQ Form for Scrubbers.